From a very early age kids love to get involved in the kitchen with their mum and dad. Give them a handy insight into cooking in the kitchen with our fabulous range of kids kitchen utensils and cooking accessories. 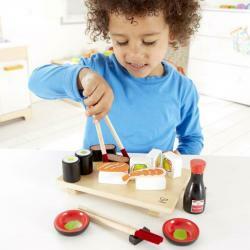 Kids can toss their own pretend salad and cut their own fruit, make pancakes and pizza or even sushi. Our fantastic selection of childrens kitchen toys will have your kids quickly prepared for real life in the kitchen.